freestompboxes.org • View topic - Bogner Shiva schematic? Just wondering if anyone has a schematic for this one. I saw info on the ecstacy and the fish pre-amp floating around so I figured I'd ask. If you find it please PM me - I would like to see it too!! I guess looking at the ecstasy preamp and the fish does give some understanding on his design. "Curiosity may have killed the cat, but it saved the mice, who ate the cheese." Could you please send me the schematic as well? I may have some interesting schematics to trade. I got a hold of a hand drawn schem. From the sloclone foums, some guys have been tracing the Shiva. The crunch channel is pretty standard marshall 2203 spec with some mods for higher gain. 3 gain stages + cathode follower. the 2nd gain stage is much hotter than standard marshall 2203. Phase inverter and power amp are pretty much exactly like marshall 2203 spec. the feedback resistor is not in the pic, someone said it was 64K. This schematic is not finished and is full of mistakes!!!!!!!!! here is a more complete drawing, this is not my drawing just provided some info, all of the credit goes to stephen Raab an e-mail correspondant from the ampgarage. Super cool guy, and I hope this helps some of you. Again a schematic with mistakes!!!! Sorry guys, but if Mr Raab took this schematic also from the parts on the sloclone bb he isn't the one who will get credit for this. There are some similarities between the shiva and the ecstacy, voltages are different though, the shiva has higher voltages in the fx loop and PI and also on the last gainstages of the od channel. The way the power-supply is build up is very much alike, same basic cap values, it's like 80% of the ecstacy. The loop in the shiva isn't that great, I tried to lower the 10k cathode resistor on the loop return, to make the return hotter but all I got was a lot of signal+hum. The send/return has a groundloop and that's enhanced greatly when making the return hotter. I'm 100% sure the groundloop is in the send/return because I omitted the loop completely, taking the signal from the od channel master, direct into the PI and there was zero hum....go figure!!! So next task is to find the scource of the groundloop so I'll be able to use the loop without the opamp based boost circuit in the shiva. okay, I remember you talking about the loop. Yeah the voltages are higher to clean it up, making it more like an old marshall character. It seems you could implement another loop maybe a dumble style or demeter type, rather than the bogner one with an op amp. Yeah, I've been thinking about taking the loop out and build a new loop! I've seen the Dumble loop but never saw the Demeter style loop, are there schematics anywhere? Personally I love the loop in the CAAA od100's. the cae shares alot with demeter's stuff I wouldn't be surprised if they are very similar. and Bogner Uberschall, someone has schematic of this? Take a brown Twin channel and melt it with a Marshall 2003 (+a bit more gain and mids) and you're there. Compared to a XTC, the lead channel of the Überschall is more agressive and tight (like the Engl Powerball/Fireball and the Framus Cobra). Increasing the value of the anode R in the dist-stage will produce this aggressive tone. Powering the circuit with higher voltage tightens the sound and produce a more agressive sound too. BTW: I would change the Marschall tone stack for a Diezel tone stack in the lead channel. IMHO way more flexible and better for finetuning the tone than any stock tone control. JHS wrote: Design your own SHIVA. Is the Diezel tone stack you're talking about the one from this thread? JHS wrote: Is the Diezel tone stack you're talking about the one from this thread? To me this tone stack looks more like it was copied from an Engl amp. Same issue like the stack in a Marshall 2003/4. At high volume it will do nearly nothing to the tone, a bit mid scoop, not more. I like the tone stack from the Cobra way more, not that interaction between T/B/M frequencies and it does a lot to the tone, even at full bore settings. IHMO the Cobra was inspired by the Diezel or desingned by him. Both amps play in the Champions League and generate similar tones. yeah that's the bax, or rather a james, because the bax is active, the james is passive. It's merely a vox tonestack, but you have control of the mid instead of it being fixed like in the Top Boost AC30's. The cobra really pulls it off well, but it is merely an SLO with a james tone stack. Diezel might have had a hand, but I really can't see his signature on that circuit, it's too cut and paste and there are some cold bias things that are in the cobra, that I doubt Diezel would really use. The uberschall is a completely different beast, but still has that marshall 800 tonestack, which makes little sense to me, you can find it in bassmans and plexis and as the previous poster said they don't too a whole whole lot once the thing is cranked. It would probably do more, if you took the master volume out. 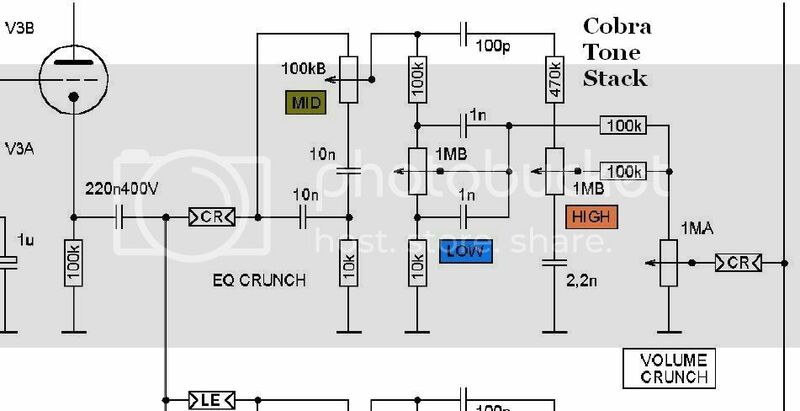 the diefet tonestack was based on x88r soldano schematic is what ech0es has explained. The engl stuff is more marshall/mesa inspired especially in their presence controls, they do more to shape the low end rather than the high ends that marshall employs. engls are pretty interesting in what they do to combine alot of different amps, yet they still have a very solid state sound and feel to me, like those old orange label randalls that were around in the late 80's and early 90's that white zombie, nirvana for a little while, and dimebag played.